Terry Markman presented the Free Market Foundation’s (FMF) oral submission at the National Energy Regulator of South Africa’s (NERSA) public hearings on Eskom’s tariff increase application on 5 February 2019. Eskom has applied for tariff increases of 15% per annum for three years. If granted, these increases will result in a 381% above inflation increase for the decade 2007–2017. 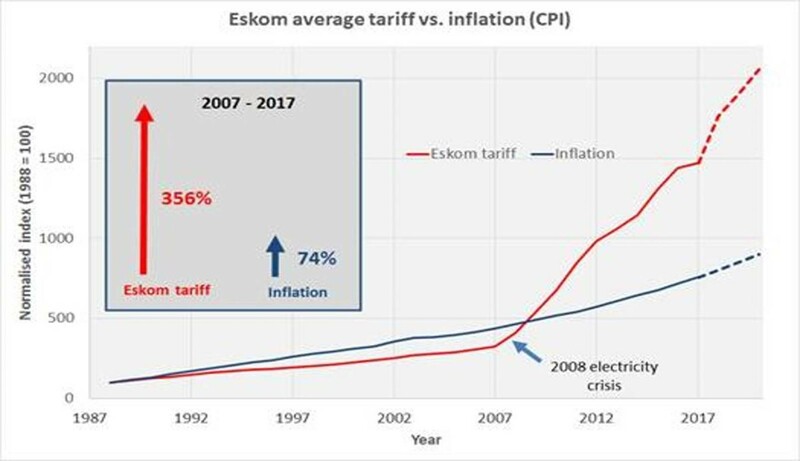 The reasons for the requested tariff increases are myriad: gross inefficiency, poor management, maladministration, corruption, high wages (increased by a multiple of 4 times in 10 years), and overspending on the Medupi and Kusile power stations. The South African consumer and taxpayer is once again on the hook for Eskom’s failures. From the annual Eskom reports, between 2007 and 2017, the number of employees increased from 32,674 to 47,658. However, employee costs over the same period increased from R9,451m to R33,178m. According to the World Bank, Eskom was overstaffed by 66% in 2016. In May last year, Chairman Mabuza reported that the staff complement should be at least 30% less. Eskom’s failure to contain costs and tariffs so as to provide customers with adequate electricity at a reasonable price has done enormous harm to the economy with losses in production and job losses. While Eskom has employed an additional 20,000 people to produce less electricity in 2017 than in 2007, it has probably been responsible for the estimated 100,000 job losses elsewhere in the economy. A substantial increase in tariffs will result in lower demand from consumers, which, in turn, means reduced revenue for Eskom. By not addressing underlying flaws, increasing tariffs will only temporarily plug a hole that will never be fixed. Markman, former chairman of the FMF’s Energy Policy Unit, made clear that Eskom should not receive any increase until costs have been prudently and efficiently determined. Eskom’s actions do not merit any sort of increase, no matter how large or small. Markman explained that NERSA must tell the Departments of Energy, Public Enterprises, and the Treasury, to address the fundamental problems afflicting Eskom. NERSA should advise government to establish an independent grid, sell power stations and encourage competing power generation, deregulate the energy sector to increase competition, reduce staff and sell assets to pay down debt and create an energy market. Competition will force energy producers to be efficient, curtail costs and provide South Africa with energy security. When European Union countries introduced competition in the form of access to grids, prices fell by up to 20%. The UK broke up their electricity monopoly and it took 20 years for prices to double. The USA has a multiplicity of competitive companies. It is international best practice to have competition in energy. The bottom line is that giving in to Eskom’s past demands has not led to an increase in efficiency and the solving of internal problems. So NERSA has to put its foot down. Eskom should receive no increases and be forced to solve its internal problems. Companies in financial trouble resolve their problems by increasing efficiency, reducing their wage bill, selling off assets, and recovering amounts due to them and not just blithely proceed with business as usual. Creating an energy market is probably the most important objective for South Africa to pursue. Doing so will solve a host of problems. For it to function properly there will have to be an independent grid with competing independent power stations providing electricity. Subject to safety regulations, anyone should be allowed to produce electricity and sell to anyone else. Continuing on the path followed in the past 10 years is not an option!